Perovskia atriplicifolia or Russian Sage, a lavender alternative. Pale blue to mauve flowers appearing on spikes with gray green foliage that is attractive through the season, (Perovskia atriplicifolia ) adds a mist of colour to the garden in summer to autumn. And although the common name is ‘Russian Sage’ this is a plant that is originally from Afghanistan. Used in the general garden border, Russian Sage (Perovskia atriplicifolia ) can also be used as a low hedge plant. In the garden space the plants at 1m to give them adequate room to take on a natural shape. As a hedging plant space them at .5m apart. Excellent when used as a foil for ornamental grasses. With foliage that gives off a perfume when crushed this is also a plant that is suited to use in a sensory garden. Also excellent for attracting bees to the garden. This is a great plant to grow in cooler climates where lavender sometimes struggles. We find this to be a drought tolerant hardy plant once established. It does require a sunny position and a well drained soil. When planting, dig in some well rotted compost and aged manure first. Water in well with a liquid seaweed fertiliser and mulch around the plant to help maintain a cool root run. Both new and established plants can be pruned. New plants can be cut back to shape and eliminate any week growth. Established plants can be cut back to 1/3 meter in autumn or winter. In spring once new growth commenced trim them back again lightly. Blue Spire – Silvery grey foliage with blue flowers to 60 cm. Little spire – Broader foliage, blue flowers. Flower Colour – Pale blue to mauve. Leaf – Mid gray green finely cut and aromatic when crushed. Water – Will require extra water only during very long dry periods. 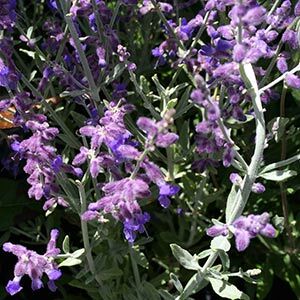 Where can you buy Russian Sage? Russian sage is available for sale from the following participating nurseries.